This release savestates and some other things. Note: the DS-mode firmwares in the 3DS and DSi aren't bootable. They only contain the bare minimum required to run DS games. Be sure to enable direct game boot when using such firmware dumps. Savestate settings: for now, whether to save to a separate savefile after loading a savestate. Screen rotation: lets you rotate the screens, for games that ask you to hold your DS sideways. Screen gap: sets a gap between the screens. Screen layout: natural (screens always stacked on top of eachother), vertical (screens always laid out vertically), horizontal (always laid out horizontally). Screen filtering: enables linear filtering when the screens are scaled. Hi there, don't like to be a neg first post AND I'm sure its something my end so hopefully an easy fix.. 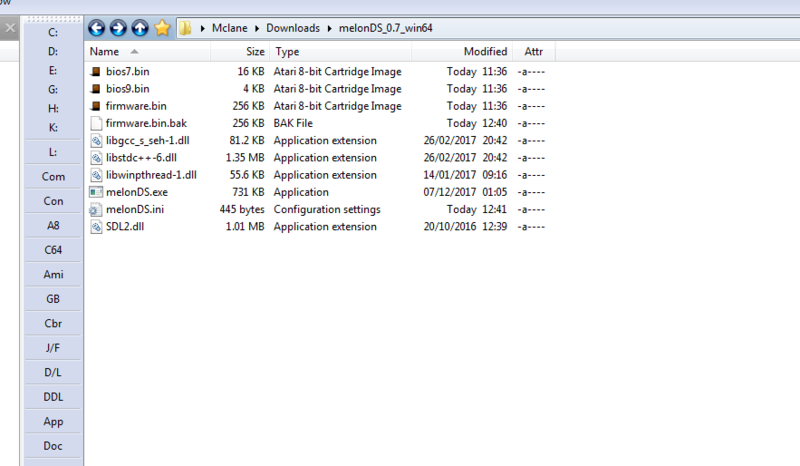 I start Melon as I have done in the distant past and it just crashes after you attempt to run a game, all the bios files are present in the main dir as directed and I even changed the bios files with others just to make sure. Checked the naming as per the instructions..Still crash on game run..Crashes if you just run it with no game selected too..
Only 2 changes in my system, a new Nvidia card (GTX 750ti, its an old Dell with not a lot of GFX choices) and its now up to a i7 4th gen..
Has the program changed since the early version I tried so it uses stuff only supported by the 900 series cards on? Paul.....Hope you can help....Thank you..
do older builds still run fine even when downloaded fresh? Last view: 179 days ago I'll just try that now, should have thought to have done that myself, sorry about that..
Back to you good sir ..
Last view: 179 days ago The pic is a dir AFTER I unpacked the version 6 in to test and now the ver 7 is readded it works......Just going to look and see the difference BUT I think you know..Ta muchly..
Edit: looks the same (as in what is in each 7zip file) now I looked at the V6 and V7 binaries but whatever happened from running the V6 seems to kickstart the V7...Weird..
Last view: 179 days ago Oh well, all done and sorted..Thank you..
Last view: 7 days ago Where are the config settings in Appdata for Melon? I'm not finding it anywhere. you can put melonDS.ini and BIOS/firmware there if you wish. you don't have to. Last view: 171 days ago Is it possible to try fixing Resident Evil Deadly Silence sound problem ? 5 minutes into the game and the background music and sound is always skipping throughout the entire game. I have tried this game on the deSmuME emululator and same sound problem persists. MySQL - queries: 29, rows: 101/101, time: 0.011 seconds.